Keep your bar queue short and represent your event’s contemporary atmosphere with the All Purpose Building and Streetlights Drink Ticket. Lights and buildings whiz by in this template’s background, adding a dynamic energy to event details. Custom printed on quality card stock, it feels great in hand and minimizes wait time by eliminating the need for processing transactions. 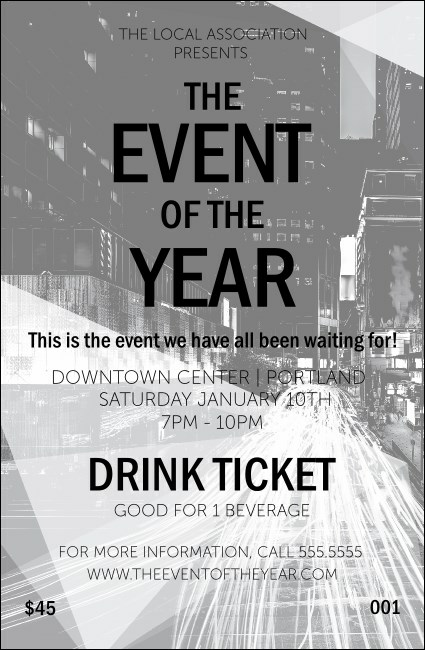 Approximately measures 2.71" x 4.14"
Browse TicketPrinting.com to find the drink ticket design that reflects your upcoming event’s vibe.